Cross City, Florida is located west of Gainesville along US Highway 19. It is a small town nestled between the Wannee River and the Gulf of Mexico. 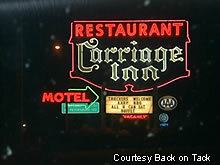 The Carriage Inn is one of only 3 motels in town. It offers a place to rest and fill up on their home cooked buffet. 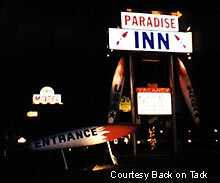 The Paradise Inn on Route 192 in Kissimmee is quite the bomb. For reasons unknown the marquee to the motel has two large torpedoes firing off its sides. It is kind of an odd sight to see, but almost camouflaged by all the weirdness around it. On this same stretch of road is a building shaped like a giant orange, another with a doorway that looks like a 35mm camera, a restaurant in the shape of a jukebox, a parking lot with the world's second largest alligator and a huge golf ball in the sky sitting atop an immense tee - and that's just for starters. The businesses in Kissimmee go to great lengths to attract tourist attention due to their friend Disney. 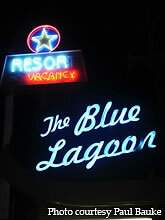 The Paradise seems to be no exception and at $20 a night they aim to blow away the competition. 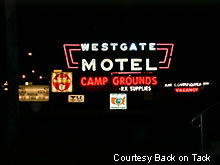 The Westgate Motel comes alive at night with several smaller signs surrounding its center piece. Not only can you grab some shut eye in one of their 21 rooms but you can purchase mobile home supplies as well. Which way to the Arrow Motel? Well, this way. 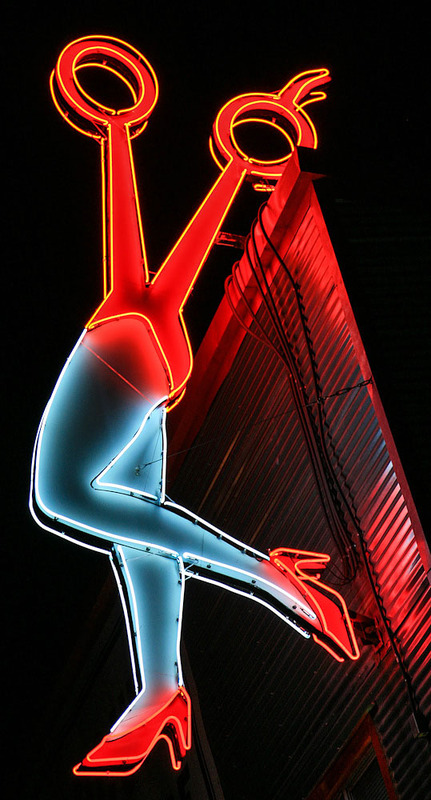 The Arrow Motel features a neon sign with a rather large arrow, befitting its name. The Parliament House looks to be a pretty eventful place, especially in the evening.